You have been working with a student on a particular sound for 3 months and can’t seem to get past the carrier phrase level. Your student isn’t super motivated to practice, so half the session feels like you are managing behaviors. Then, you give the student homework only to never have it returned. When you sit down at the computer to write this student’s progress report, you wonder, “Will this student make enough progress to meet his/her goals?” Or better yet, will your student EVER graduate from speech? Can you relate to this situation? Between planning articulation therapy lessons, and trying to implement best practices for articulation therapy it can be kind of hard when you have the actual student sitting in front of you. Then, when you add that student into a group therapy situation, it can be even harder to figure out how to increase repetitions, take data, engage the child in the process and work on generalizing skills into new contexts and across settings. Let’s just say articulation therapy can get a little tricky at times. However, I definitely feel that goal writing and data collection is way easier than other treatment areas. My biggest area of struggle is having the tools and knowledge about how to get my students to generalize their sounds outside of the speech room. If you need articulation therapy ideas, you have come to the right page! Over the years, I have had to manage planning articulation therapy in mixed groups and have had students who really needed to graduate speech, but were still at the sentence level with their sounds. As busy SLPs, it can be hard to plan engaging articulation lessons that align with research and will help motivate our students. Those of you wanting a refresher on Speech Sound Disorders and where to start with your students, check out ASHA’s page. Also, ASHA has these great evidence maps that can help you with determining how to implement evidence based practices in your articulation therapy approaches. This blog post has a lot of ideas for how to increase articulation productions and still make therapy engaging. You can always start the session with a quick warm up or data probe. Review of the sound production and then the ideas in this blog post can be your activity to end the session. You can use this DIY bottle caps game to work on sound productions in your therapy activity with FREE articulation printable pages that I found. 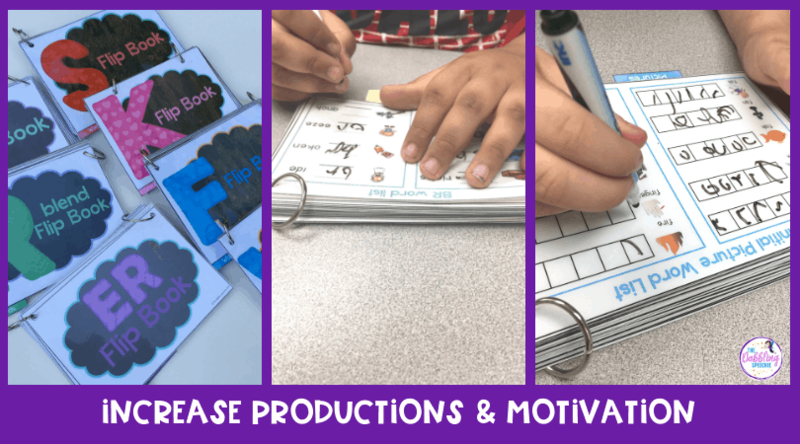 If you are doing a 5 minute articulation approach with students, my interactive articulation flipbooks can be really helpful for having materials that you can easily carry around to classrooms. Read about the 3 ways I use these books in therapy HERE. Do you have students with L errors? Try the L articulation flipbook for free in my TPT store. Crafts can be a way to keep kids motivated with practicing their speech sounds. I like doing a craft once a month that serves as a way for me to progress monitor the student during the session with spontaneous speech. Plus, I send the craft home as a homework assignment with the student’s words attached. If I don’t send it home, it has served as a bulletin board and my students will use those words from the craft as a warm up activity. Within the last couple of years, I have found the value in putting an emphasis on increasing the student’s self awareness of his/her productions. At times, I can get tunnel vision that the session didn’t go as well if we didn’t get 100 or more productions. Taking the time to invest in the child judging his/her own productions can really help with generalizing the speech sounds beyond the isolation and word level. I discovered that when I did activities to help with self awareness, my students could monitor their speech better, explain what they were working on in speech to others and felt a sense of accomplishment when they noticed an improvement. 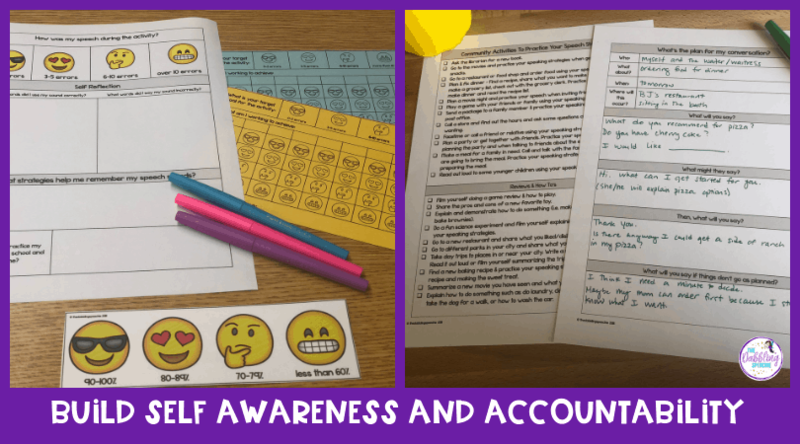 If you need ideas for increasing self awareness and FREE printables to use in your therapy sessions, check out this blog post HERE. “Don’t forget your good sound”, “Remember tongue up”, “Think about your sound,” are pretty familiar phrases SLPs use when working with students with speech sound disorders. If you are wanting to fade back those verbal prompts or are trying to visually cue your student during conversational tasks, check out these FREE visual cue printables for your students HERE. It can feel so defeating when your student is nailing all their productions in the speech room and then you hear them in the hallway with the old sound. We want our students to work on their speech outside our therapy session, but sometimes having the time, and resources to follow up with the student and teachers can be tough. Here are some ideas to bridge the gap between the speech room and other settings and people. 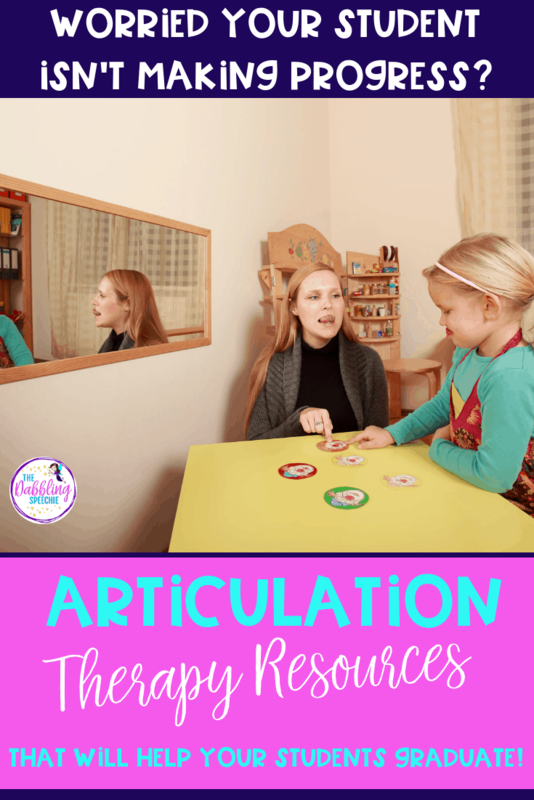 If you are looking for materials that will help your students practice their speech sounds beyond the structured sentence level, check out my activities for articulation carryover. These activities also align with many language goals, so they are perfect for mixed groups. You won’t feel lost with how your students are doing on these activities because data sheets are included! This blog post has a lot of great ideas for working on speech sounds beyond the sentence level including a website with FREE reading passages. What Articulation Therapy Ideas Work For Your Students?